Background: Had an unplanned meeting with BBMP, thanks to Ashiwn/SB. Part of our initiative for better road design. This was at an hours notice on a weekday and was pretty much took half the day, so was not a good candidate for an event. Anyways, we discussed the pedestrian infrastructure, footpaths etc. We know that the quality needs improvement, and I have already documented what goes into footpath design, which I shared with BBMP folks. In general they seem appreciative and want to improve. It helps if we give specific inputs in a structured manner, rather than just rant and crib. Footpath material: So here's where we can help. They want to do Hosur road, from Silk Board junction to Vellara as a model. This will have pedestrian and cycle tracks !. The total width of the footpath plus cycle track on either side is currently planned around 3.5m. Of this there is cobbled stone (interlocking pavers type) on the first 1.5m, There is a drainaige of 1.4m plus an additional overhang of 0.6m totally 2m which will be joined slabs. These do not give good finish and they are planning to put a paving over this. One specific suggestion asked - any suggestion on paving material/colour which will be suitable and look good ? Cycle track: Am not sure we can change the course on this, but let us discuss and if there is something that makes strong sense, we can atleast try to influence. Its not as easy as lets put a cycle track ). At this point plan is 3 lane carriageway each side, we are left with exactly 3.5m on either side. Second is the space required: A cycle width is upto ~ 60cm. You cannot drive a cycle on a straight line, with a 20cm margin it is 1m, you need to allow at least two cycles side by side which makes it 2m. 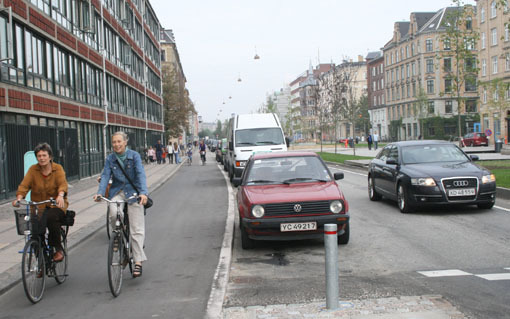 This is the minimum IRC standard for dedicated cycle track, danish standard for eg: is 2.2m. Right now we have exactly 2m, and footpath of 1.5m which is again minimum prescribed. This is not going to make cycle driving very pleasant however. One thought: Combine cycle tracks to a single side. This will give a lot of space for cycling, part of it can be a verge barrier etc, make it pretty and nice. Does this result in too much of cross movement ? I think we can give longitudnal parking for cycles along the track, people can walk across to shops on the other side. If they want to take cycles, they will have to walk with the cycle on the footpath on the other side. for the length from the crossing. There is always the 'we can get more space from somewhere', or remove a lane etc, but what is the best that can be done in the given situation ? I will continue to post on this blog for further thoughs/updates etc. Please feel free to give whatever thoughts you have. Dr. Mahesh had in fact taken a sample Flo-grid from me which he said he would show to CE (Major Roads). I was wondering whether it was shown at the meeting at all and what CE's response to the same was.? As you are aware Atlantis has the best solution for suggesting ecologically sustainable pavers / pavement material and cycling tracks. Since our Flo-grids are modular in nature and can be firmly clipped together, desiging anysize of cycle track would be easy. It can all be done in one day (3.5 metre wide X 250 metres long). We can leave it as Flo-grid surface or grow green grass through its mesh which will make the cycle patch look even better and more distinct. Anyway, I am not using this forum to promote our technology. Just mentioning that excellent solutions are available. To try out our ecologically sustainable technology, I have found an investor who is willing to take the order from BBMP in his Company's name, invest in our design development, detailed drawings and turnkey provision of solution and products including actual installation for remodelling the Silkboard junction and after it has been done and proven beyond doubt that our technology really works, will he invoice BBMP. That really means BBMP does not have to spend a sue upfront! What better proof of our technology can they get? Only shows how the Private Sector who have actually seen our technology in operation in foreign countries have complete faith in us and the big question of "not being tried and tested in Indian conditions" is not valid anymore! I have already appraised CE (Major Roads), BBMP about our offer. Wonder what we can do to get them to actually issue the works contract? They may want to consider plain old asphalt or concrete in lieu of any expensive tiles that may get dislocated or stolen and need replacement often. It is easier to pour and maintain concrete/asphalt. The advantage with plain asphalt side walk is that it can double up for both bikes and walking with just a painted divider. Ped interference to be expected but is better than vehicle interference due to speed mismatch and also save sidewalk real estate as you point out. Key is to have it marked clearly with copious amount of flourescent paint and maybe cats eyes for better visibility. Since RKC has been persistant in trying his technology maybe this asphalt can harvest the water and the overflow can go to the drain. I second your idea, Cycle tracks can be provided only on one side of the road and a ped/cycle crossing be provided every 500 meters to cross over (300 meters where there are more shops mostly in madivala, adugodi & Forum mall). These xings can be pelican lights or elevated like in other parts of Bangalore or both. Simple cycle stands can be provided near the ped xings where shops exist for people to park cross over and do their shopping. On the footpath material, you might want to check out the new pavement opposite the BMLTA office building. It looks very pleasing to the eye. Not sure on durability, but that sort of footpath makes one want to walk on it! :) Don't have pictures but it is that red checked material that you also find in some parts of Basavanagudi. One cycle path makes a lot of sense given the cycle traffic and the fact that head on collisions are rather rare in the case of cyclists. Better to have one 2.5 m track than two 1.5m tracks on either side. Still thinking on where to place the cycle lane. With pedestrians means we need to keep the cycle lane towards the inside (not adjacent to the road) as bus stops will be placed and you don't want cyclists riding through the bus stops. Or we put bollards instead of kerbstones as separators and keep 1.2 m of cycle lanes adjacent to the kerb. Excellent IDS. You did mention that you prefer bike on one side. You did put up a picture of cycle track on both sides - that was just for example - wasnt it ? Will try and develop it a little more and put in some drawings. RKC - have understood your concept well - so no more value add selling to me. The final decisions of course rest with BBMP on what to do/not to do. You did put up a picture of cycle track on both sides - that was just for example - wasnt it ? If you are referring to the crossing, that was only an example. Here is another picture of a cycle/ped xing. Notice the ramp for the cycle crossing on the far end. This ramp is very important without which the crossing becomes irrelevant for cycles. If you are referring to the sidewalk picture then that was an asphalt single side sidewalk with the yellow line demarcating the cycle track from ped track. Here is another one where the demarcation is physical, with slight depression in the asphalted cycling are vs the raised tiled ped area. Both work well I prefer the paint demarcation (possibly with cat eyes) since it is easier to maintain. Here is a sidewalk being built with ramp for bicycle track. This is a concrete sidewalk. Just wanted to mention. Like SY says, you can plan for the side walk on the side where the cycle tracks dont exist to be a little smaller so the space borrowed from there can be utilised on the side where the cycle tracks can be laid. It is not necessary for both sides to have the same size sidewalk as long as they adhere to the minimum standards for sidewalk. The advantage of having tracks on one side is the other side can be used for trees and parking. Here is an example of how the cycle tracks get on to the road when there are trees etc blocking the road and then go back up to the sidewalk when the way is clear. The key is to visually indicate the cycle trackand demarcate it from the walking area. 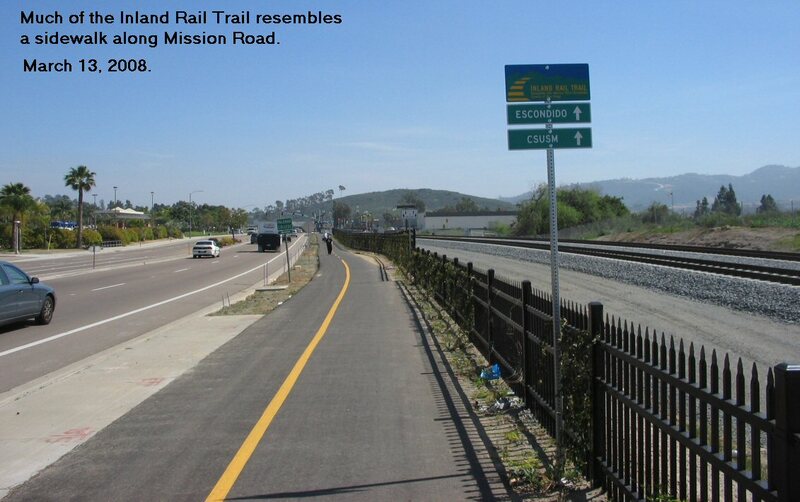 Here is an example where cycling and pedestrian path are shared. There is no seperate pedestrian path. Have to admit this works in less populated countries. It can be dangerous in India where we expect the sidewalks to be populated thickly. 1) I feel it's best to have cycle tracks & pedestrian walks on both sides, rather than one on each side since there is ample width (3.5m or 11' 6" each side). 2) Asphalting the complete width of 3.5m as a whole may not be acceptable to BBMP since drains need to be desilted & cleaned at periodic intervals. Thus, some type of removable slabs or equivalent have to be placed over most, or all of the 1.4m drain width. Since there is another 0.6m beyond the drain (outer edge), it may be best to fit removable slabs over the outermost 1.8m width, followed by about 0.2m of elevated separator (similar to kerb stones) to demarcate cycle track from the side-walk. This separating divider could be an extension over the vertical side encasement for the drain & could be sadahalli granite (fine cut) which is strong, or cast concrete, painted (zebra stripes, for example). a) Allows recessed level (same level as road, or lower) over drain. The drain needs to be at road level or lower to facilitate effective drainage from the street. Easier exit of bicycles for parking by road side/s without conflicting with pedestrians; Facilitates bicycles with easier left turns into bye-lanes without conflicting with pedestrian movements; etc. 4) The pedestrian width of 1.5m can be asphalted end to end to a smooth finish, assuming of course that there are no pipes or conduits below. If there are underlying pipes, then only removable inter-locking pavers (or equivalent) may need to be laid. 5) Where street crossings are provided (roughly each 500m, but this would need to be mapped for most convenient points), the street will need a smooth elevation with reflectors across the street on both sides + painting & signage. How will they manage at Adugodi? Just wondering how they plan to have this at Adugodi given the width of the road there. One point I would like to add. The drain currently starts at 1.5m from the edge and is for a width of 1.4m. ie, drain is not at the outermost edge. Dont know why it is so, but it is so. I think 2m is good enough for the kind of cycle traffic you see today (quite sparse) and I agree there. However, assuming it really scales up, isnt it better to combine ? Or putting it the other way, does at a certain cycle traffic level, combining make sense ? Signage, Dropped kerbs (no step for cyclists/pedestrians) , obstruction free etc have them covered in my documentation/checklist. Right now want to get the best concept. a. Please ask BBMP to check the pavement opposite MS Building where the BMLTA office is. That really looks nice. b. The other idea might be to provide a conduit below the pavement for future needs such as OFCs, telephone cables, etc so that digging need not happen in case one of our telecom companies wants to put cables. Place removable slabs every 100m or so to facilitate any future cable laying. Exact design is not important here - but I think you get the concept. Therefore prefer no asphalt. c. Railings separating traffic from pedestrians. With such a nice level pavement, the temptation will be very high for bikes to start using them. They already do so near the home for the aged. this will also avoid cars and bikes using pavements as parking spots. Where railings have to have a break for gates, etc, provide concrete bollards perpendicular to the railings to prevent intrusion of vehicles. d. Should faciliate wheel chair movement without hinderance - means no suddent level changes, etc. It does not matter whether a single wheel chair ever traverses it, but the spirit of accommodating differently abled people should show up in this design. e. Tactile tiles at crossings to enable the visually impaired to cross along with chirping traffic lights. Again same principle as in (d). We need to make a start on these things somewhere. Asphalted cycle path is again going to be impervious. How will it infiltrate storm water? The pervious pavers we suggest is made of recycled polypropylene - practically of no value to anyone who wants to steal it! It gets clipped on and is so snugly fitted with sand underneath that it is not easy to wrench it out. Each slab gets clipped on to the next, so it can be installed in a day. If MTNL or BESCOM needs to access cables underneath it, it can be easily removed with special tools and replaced without damaging anything. Any gaps, holes, etc easily visible at night. Allows water to percolate. However, assuming it really scales up, isnt it better to combine ? Or putting it the other way, does at a certain cycle traffic level, combining make sense ? For this very reason a seamless asphalt or concrete with painted division will suffice. This way you can move the cycle lane around by just repainting instead of changing the entire layout if recessed or tiled etc is used. Also if the cycle traffic increases in the future it will be possible to dedicate one side purely for cycles with minimum space for peds and keep the other side of the street dedicated to pedestrians. Also tiles is not preferred for cycle tracks as they tend to dislocate and break and you will end up laying concrete or asphalt anyway for the cycle track which then will end up like making it permenant. So I would recommend a concrete sidewalk end to end (except where the utility/drains are on the outer edge) with painted seperator (or any other changable seperator like cylindrical bollards etc). SB-Vellara: Even More Thoughts ! The drain currently starts at 1.5m from the edge and is for a width of 1.4m. Is this along the entire length (ie. from SB to Vellara) ? I think this may pose problems for separate bicycle & pedestrian tracks. If bicycle tracks are positioned immediately adjacent traffic lanes, then, as Srivathsa says, it will necessiate railings (& these railings will be broken up by several vested interests at points convenient to them to bring their vehicles in !). So, I am not sure if providing cycle lanes adjacent traffic is a good option at all. It may be better to combine both - this will also allow for any future variations in the no. of bicycles or pedestrians, as you mentioned. The disadvantage is that the whole of the 3.5m has to be elevated above street level to ensure that vehciles do not misuse the space & there will be no demarcation for different uses. dont think the pavement needs to be reccessed for storm water draining purposes as a channel with grating at the road side will be provided which will go under the slabs. Quite right - they have been doing this almost everywhere. In their traditional design, in some congested streets, the drains are immediately below sidewalks that are at a higher level than the street. Thus, some part of the sides of the covered drain encasements are higher than street level which is a waste of capacity. Also, the drains tend to be shallow (in relation to the street level) & fill up fast in rains. Thus, water collects on streets early during rains. I was only attempting to improve the design in this aspect. If the ground surface (in way of sidewalk or cycle track) is at or below street level, it will generally allow for better drainage, since even if channel entry points are choked with debris, water will find it's way to the sides from wherever possible, such as at driveways /alleys where there are breaks along sidewalks - BBMP & it's contractors have been elevating this portion too, at crossings to allow the drain to pass beneath by increasing the height of the street ! I agree, but as you mention, it depends on the street conditions. Since we are talking about a long stretch with only a small part near Vellara junction, Adugodi, near Forum & Madivala where there are shops, it may be better to position cycle tracks outermost, but this is now not possible, I guess. I think Srivathsa's suggestions are worth noting - provisions need to be made for the physically impaired & the blind. Perhaps, this may be the place where we can make a start. #1. what separates separates the main carraigeway from this ped/cyc way? #2. why is a 1 m wide separation needed? three feet tall grills will do the task no? #3. also whenver there is a boundary, there is a small cushion zone which will not be used. for example, if we consider a grill, then about a feet on either side will not be used. #4. what sort of businesses are there along the road. and how are they accessed? sorry for asking these dumb questions rather late in the day. about ordering. if this 3.5m is vehicle free, then we should not split hairs trying to separate cyclists from pedestrians. unless ofcourse we have dedicated cadre of people cycling to work. about the pavement. i dontmind chappaDi kall or tile or concrete. but it is very important to pay attention to the subbase. they have been repaving the entire neighbourhood all summer here. 3 months for footpath and drains. but by god does it look solid and useable. Asphalted cycle path is again going to be impervious. How will it infiltrate storm water ? The removable slabs over drains are normally provided with small holes to help in removal as also to drain the surface when it rains. Thus, water-logging is not an issue for cycle tracks or sidewalks. naveen's point about vested interests breaking the railing. how would this work? this is clasic bangalore style no? or is it too old fashioned now. perhaps they can put some bouganvilles or something more robust. another question, where are the light masts? if they are at street level, then perhaps they can use it as a part of the separator rather than let it jut into the 3.5mtrs. especially since they have wide bases. #1. what separates the main carraigeway from this ped/cyc way? I guess the pedestrian sidewalk will be elevated, as is the norm. I dont think we spoke of any separation by width. We have 3.5m to work with, out of which we were thinking in terms of 2.0m for cycle track & 1.5m for sidewalk. This stretch is about 6.6 km. There are some shops & commercial establishments near Vellara Jn (one of the end points), at Adugodi (stretch of abt 0.8 km), around Forum Mall (abt 1/2 km), & at Madivala (>1 km). Thus, well over half the distance is free of commercial /retail activity. As I mentioned long ago, unless secure infrastructure is provided for bicyclists, there will be very few or no bicyclists. This might seem wasteful now since there are few bicyclists, but there is already a growing awareness, which will increase only if such facilities are provided & bicycling is encouraged. where are the light masts? Suhas is preparing the designs. I think since separation for pedestrians & bicycles cannot be provided due to the fact that drains are positioned midway, the street lights can be at the edge, but jutting into the 3.5m for traffic safety. The 3.5m width should permit this easily. i am trying to understand the basic layout. 6.6.kms. of which some parts have business frontage. rest is empty as of now. median is where the piers are.either side of it, there is two lanes of main carraige way. and one lane of access road. and then there is 3.5 meters of space? in this picture the drain is between the main carraige way and the access road. or is this an old image and the drains have been moved? if there is an access road (which makes eminent sense) then where do vehicles that patronize shops at places like adugodi park? We have 3.5m to work with, out of which we were thinking in terms of 2.0m for cycle track & 1.5m for sidewalk. i think it is important to know if the lane next to the ped/Cycway (PCW) is an access road (AR) or the main traffic lane (TL). if it is AR then it might not be necessary to raise the PCW. but if it is the TL then it is important to raise it. Also if it is AR then the type and design of railings will have to be different. while that is sorted out. let us assume, that we have 3.5 meters for ped/Cycway (PCW). with drain in between. and drain needs regular work. and needs openable covering. one important thing is CW, FP and Drain all have to be at the same level. in whatever configuration, cycle lanes cannot be next to shops. for obvious reasons. i think if there were no marking the natural flow would be - peds will settle next o shops, cyclists away from it. the design should reinforce this. i think drains in the middle is sort of a blessing, because it will act as a natural marker to separate cyclists from pedestrians. cycle lane(CL) next to AR, fotpath (FP) next to stores. make cycle way also tar. what this does is moves the crumple zone of tar into CW - which is a low stress zone. AR is thus strengthened. drains: if the PCW has to be raised, then one thing that can be done is raise the drains too. this might be a good time to redo the walls of the drain, raise it, give it some recess of about say 2in with perforated concrete covers. footpath: frontage to stores people seem to like brick pavements. go ahead do it. so this red. in places that are empty, they can just do the cheapest option. ped areas need not be bricked. if tar is cheaper to lay they can make it tar. i guess what i am saying is natural order is cycles next to road and peds closer to shops. drains are cement. for cycle way and footpath use materials that reinforce the natural order. dont try to enforce an artificial order. and dont try to fine tune the usage of 3 feet on the drains. some of the pics above are misleading. those are leisure peds and leisure cyclists. their attitude and approach is completely different to people who are doing either with a dedicated timebound purpose. which is what people in blr are likely to be doing. one of the things i have been observing here is they are using machine cut granite dividers between causeway and footpaths. solid they are. the edges are so sharp that if tires hit them at the right speed, they will burst. plus they glisten in bright light. which is pleasing on the eyes. concrete is good ids. but isnt it very resource intensive? especially since to really make it work they have to lay a a couple inches of pure concrete.but i know why you like it. if they do a good job of it, it can be a solid surface. i hope they provide a slight 1% gradient on both CW and FP that leads into the perforated drains. ideally i would imagine they reprocess the top soil that they dug up and make bricks. Can Traffic Lanes be Offset from CL ? The photos you posted links to are probably Hosur rd, but well past the 6.6km section that we are talking about here. This 6.6km is between Richmond road & ORR (not past it) - & is close to the city. This section was being planned for widening with acquisition of land/s from the army for a long time. I presume this has come through now. What I meant when I said that there wasn't any commercial /retail establishments over half the distance was that there were built up areas, but these areas do not attract traffic halts due to absence of commercial /retail activity. Allowing for 3 lanes each way, there is 3.5m each side that can be utilised for pedestrian & bicycle facilities. There are no provisions for service roads as there isn't sufficient width. I think you have a good suggestion - however, this is up to the BBMP. I am not sure they will think along these lines since they might assume that it is better to center the traffic lanes in the middle, as is conventional. I think the suggestion by IDS is worth exploring - if the traffic lanes are slightly offset from the center line, we may get a wider bicycle lane, though only on one side. In Bangalore it does not matter if a road is an AR/TL. People drive as recklessly on one as they do on the other. I would grade separate even if by 4 inches the CW and the road. Or put bollards all along so that cyclists have a sense of safety. Railings or cylindrical bollard+chains have to be put. We have to prevent intrusion of pedestrian on road and motorist on footpath. I second your idea on design. Let there be 3.5 m of level pavement. Have a soft dvision between walkway and CW. While cycle-man collisions can be quite serious, I think the cycling speeds in Bangalore are not at a point where serious accidents are likely. I think concrete/asphalt/tiling can be used - some basic level of aesthetics needs to be in place. Lay it in a manner that no stagnant water remains on the pavement after rain. Motorists should not be able to intrude. Wheelchair friendly as well. Crossings need to put at intersections and then where there is a likely need e.g. shops on either sides, near bus-stops, etc. Consider this if the bicycle lane is not buffered by the drain area where parking is allowed. as i said, i am unsure about the overall layout. now this parking on drains in a new thing. that changes the entire dynamic. for one, vhicles entering and exiting parking zone need legitimate access. in mysore sayyaji rao raste faces this problem. arun and i have broken our heads on this for a while now. there is really no solution for our condition. unless parking is moved out of the equation. the basic issue is roads have a function - they provide access. the real decision to be made is if a particular stretch of road is to provide point access or directional access. each comes with its own set of design issues. aside: at some point we have to make a realistic assesment of our cycling. in my days i used peddle upto 15 kms no sweat. but realistically, cycles can only provide access to about 5 kms for once a day trips, with 1-2 km circles for 2-3 times a day trips. beyond that is really stretching expectations. but these are not isolated pockets and have significant overlap. so in effect from BLRs perspective multi km stretchs might be needed. Footpath material: If concrete is in contention, coloured concrete can make it look beautiful and may cost less than pavers. Expansion joints have to be provided regularly to avoid excessive cracking and resulting unpleasantness. Cycle track / pedestrians: The "gap" between the edge of lane and drain seems wasted. Ending the lane at or near the drain location and allowing 2m on each side for pedestrians leaves (2*3.5m + 2*1.5m - 2*2m) = (potentially) 6m for cycle lanes. On second thoughts, it is probably better to have a cycle lane on one side (than one each side) with a "soft" line divider for 2-way traffic. Physical division / barrier between vehicle and cycle lanes and between cycle lanes and pedestrians is preferable to avoid misuse and accidents. The vehicle-cycle division will lead to some wastage as mentioned earlier but is much safer. It is probably more economical to have the cycle lane as an extension of the road than the footpath. No sweat , I dont think anywhere on this strech parking is allowed. Even if parking is introduced in some streches we always have the signboard ready here. But seriously i dont understand what the breaking head is all about. I just wanted to point out, you can have the drain next to the curb thereby providing car door buffer instead of pushing it to the middle of the sidewalk and try to use it like some sort of divider, which can be easily served by paint. It is probably more economical to have the cycle lane as an extension of the road than the footpath. I dont understand the economics but cycle lanes on the road is definitely an option where fast moving traffic doesnt exist. Safer option definitely is to allow cycles to mingle with pedestrians rather than with motorized vehicles. 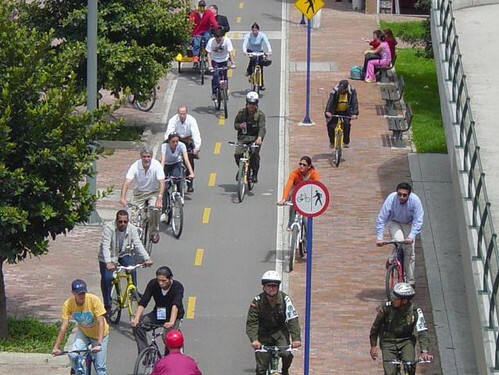 World over cycles are treated with the priviliges associated with pedestrians and not that of motorized vehicles so the first preference is to make cycle lanes on sidewalks, if not possible make them share road space with vehicles. coloured concrete can make it look beautiful and may cost less than pavers. Indeed concrete and asphalting can save a ton of money which can be used elsewhere like making geometric adjustments to the streets, flourescent paint, cats eyes etc. Colored concrete can be used for the cycle lane as they last longer than physically painting over plain concrete. Colored concrete is used to mark bus stops also. This reminds me we need to identify bus stops along the route and look at where the shelters will be placed and how they affect the flow of cycle lanes and ped path. I also have inputs/suggestions on markings and signages but that can wait till the fundamental design issues are sorted out. Better to physically seperate and endure some loss of space. do not go together where pedestrians have little or no civic sense. Do you think indiscplined drivers are better than pedestrians? What makes you sure cyclists wont be killed by vehicles? You can still put physical seperation on the sidewalk using bollards, so what gives? At idontspam - you sir, need to read through all the posts completely and understand them before pointing a "you" at others. Do research concrete barrier (better for vehicle-cyclist seperation) or traffic barrier - how will vehicles hit the cyclists if there is a barrier? By flying? Pray also tell how a bollard will prevent a cyclist from veering into pedestrians or pedestrians from making use of (and blocking) cyclists' lanes? Bollards are spaced apart and are used as crash barriers for vehicles against hitting storefronts or getting into prohibited parking locations (unless we use the term differently). Complete read-through, researched and constructive arguments are always welcome than one-upmanship or war of words with hasty postings. Nuff said (from my side). I dont understand your frustration here. Why do you believe the same concrete barrier cannot be put on the sidewalk? I have agreed with you that it is also a practice to put cycle lanes on the streets but when possible it is less dangerous to put cycle tracks with ped pathways since it will anyway be on a raised surface. So I think it is you who need to read through the comments. If you dont like my thoughts dont pick on me. I am trying to reasonable point out the pros and cons here. Geez!!! The cycling tracks need to be physically segregated from both the main carriage way and the foot paths by using fences. We have seen how undisciplined existing two wheeler drivers are, and how they ride over footpaths when they get a chance. There is no reason to assume that just by creating dedicated cycling tracks; we will suddenly see get a new set of very disciplined cyclists who will stick to their lanes. We even need to consider putting the tracks on either side of the roads to prevent the cyclists from crashing into each other. Also with the sort of crowds we have in some of the commercial areas, like Adugodi and Madiwala, it will be impossible to prevent pedestrians from walking on the cycling tracks if we don’t have a physical barrier. One other issue is the quality of the roads being built. I have see some of the road widening work being done near Madivala and the quality of the footpaths are not that great. They twist and turn to accommodate trees and manholes on the side of the road. Their width also keeps varying to accommodate existing obstructions on the road like shops, transformers, trees etc. Obviously we can’t have a cycling track which keeps twisting and turning abruptly. With all of the above issues I even wonder whether it is possible to put cycling tracks on Hosur road in areas like Madiwala where we are really strapped for space. I noticed this article this morning... quite accidentally. It might be good to check how these guys are developing cycling tracks as input / additional data point for rhis project? The discussions here could also be used to influence this cycle paths effort referred to in the article. however, this is up to the BBMP. I am not sure they will think along these lines since they might assume that it is better to center the traffic lanes in the middle, as is conventional. I agree with you if this infrastructure already exists and cycle tracks are just being retrofitted then it will be too expensive to adjust dimensions of the sidewalk for such large streches. I believe there is some road corrections being done now and it may be a good time to include the sidewalk dimension correction as well. If dimension correction is not possible we can still use the extra space on the non-cycle track side for trees which we have ignored in this discussion so far :) It depends on BBMP like you said how much they have budgeted for this model sidewalk and are they willing to accept different concepts or they just want us to provide input on the color of the tiles. Another reason for including the cycle track on the sidewalk on this strech is that since crowded areas are only in short streches the pedestrian crowd is restricted to those areas where we can use a physical traffic seperator. Agreed - since this road is presently 4-lanes (in some segments it' only 3 or even 2 1/2 lanes) & is to be widened to a uniform 6-lanes throughout, the median will most likely have to be rebuilt almost all along anyway. I am unable to understand how the drain has already been positioned at 1.5m from the edge/s. It is probable that there are drains at that distance along some length/s & BBMP wants to continue to build them for the rest of the road at the same distance. The cycle track on the opposite side will also need some sort of physical separation from traffic lanes (to prevent intrusion). Trees may have to be planted entirely new since most, if not all will be uprooted with this widening. If the edge of the road remains same as at present, some trees can be saved, but this seems unlikely. Great discussion. I have tried to summarise the key ideas that have been talked about here ffor the cycle track and put together a small presentation. This is still at a 'strategy' level and ideal scenario - the detailing discussion and implementation - whether it is possible on Hosur road we will revisit. The plan is to get 30m end to end - I belive they have already obtained it in some streches. What the BBMP is saying is they will go ahead with whatever streches are available for now - what happens in the chicken neck area is anybodys guess. Have squeezed out another 1m (assuming they are OK to narrow the lanes and median a wee bit) - so total availability for footpath plus track on both sides is 8m. To add, plan for now is not to allow parking at all on this road. Just been through the presentation - good analysis & great images ! The only thing I am uncomfortable with is the 0.7m for green strip, & only on one side - isn't this too narrow ? Just for comparison, the green strip on the road outside my house (a purely residential enclave) is 3 ft (0.9m) & only palms are being grown on it. Hosur rd is a major road & to allow for more variety of saplings on green strip/s, I think we should allow 1.5m at least, on each side. Even if we had only 7.0m in total, we would still have 2.0m on each side (either for pedestrian walkway or bicycle lane), which may be quite sufficient. Else, the pedestrian walkway could be narrowed to 1.7m & bicycle track extended to 2.3m. If we had more width available, the bicycle track (& pedestrian sidewalk) can be increased. Yes, you are right. 0.7m is quite small. Usually tree pits are 3ft x 3ft, ie close to ~1m. One thing intresting from BBMP was they said you should not plant trees on roads, it invariably cracks up the road and even the footpath - to which I mentioned you should plant the right kind of trees - of course I have no idea what the right trees are :). Anybody knows how to get around this ? I think trees (the right type:) can be planted - we see them along so many avenues abroad, well clear of sidewalks & also street edges. The problem here has been that street widths have been extended upto the tree trunks with increasing traffic & eventually, the roots crack up the surface of roads. Trees also become an obstruction along sidewalks also since width left is meagre. If proper provision is made at inception & left untouched (ie. streets not widened upto tree trunks), they will not pose problems. Some of the pictures above demonstrate this. Perhaps you could move the green strips to the edges (the 1.5m beyond the side drains) & plan the rest in line with this. For the variety of trees that can be planted, I have no idea either - this can be left open for the present & decided later. ...is here from feb this year. It has some links I had found then on roadside trees. Might be worth a look. Very good visualisation and proposal. Good work. Looking forward to some enthusiastic response from BBMP. We can jointly work on the details. I am sure you will need their input. Maybe they will think of providing a couple of meters more to the sidewalks. Trees end up between parked cars instead of in the middle of sidewalk. This way you get a well engineered 4 lane road with ample ped+cycle infrastructure with trees parking and all. WIth 6 lanes you dont get turn lane, parking, trees and end up with squeezed ped path. If 30 meters not available cut down the parking in those streches, you will get 3+ meters. If still running short cut center lane you will get another 3+ meters. You will still get uninterrupted 4 lanes+ped+cycle. If turn lanes are required only at the junctions that space during the rest of the strech can be allocated for a wider median with trees on it or for parking on the other side or for a wider sidewalk or even for bus bays. But it is important to have consistent lanes all through. 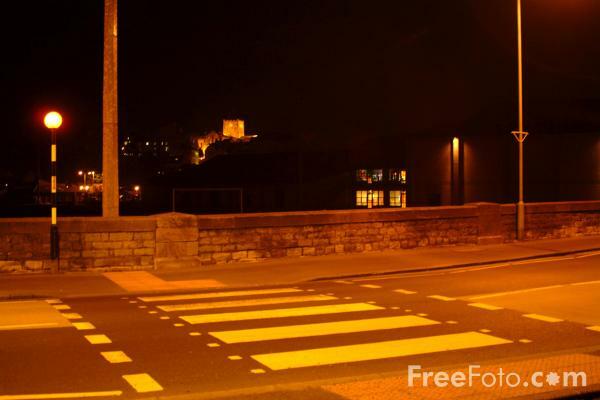 - Will pedestrians try (or be allowed) to cross 6 lanes of traffic? Isn't the whole idea of multiple lanes to allow obstruction-free movement? If crossing is allowed, it will probably be at signals where the cycles can also stop. - How about segregation between the (potentially higher number of) pedestrians and cyclists? Refer earlier post for examples of chaos. - Didn't understand the 3rd advantage. If turns are needed, they can happen at signals. The whole idea of mixing works well in developed countries where rules are followed. For example, what if there is a traffic jam on one side of the three lanes? 2-wheelers will start jumping on to the footpath as it happens elsewhere in the city. So, now a barrier is needed - why not use it to separate vehicles and cycle tracks? The kerb can seperate cycles and people (not much jamming with cycles and w/ the sharp-edge it is harder for cycles to jump the kerb). If a barrier is provided between cycles and people, it would need to be taller than the other one (more cost) to prevent prevent people from jumping/spilling over to cycle lanes (as happened w/ approx. 4' tall barriers near KBS - people didnt want to use subway and risked life and limb to vault the barrier). As far as headlight glare, it has to be endured now when all traffic is mixed. At least w/ a barrier, the worst that can happen is a cycle crashing into another one. Thus, in my opinion, it is better to have cycle tracks as an extension of road. This saves cost on providing an extra wide footpath/sidewalk and if not patronized enough, the barrier can simply be moved to provide parking for vehicles or an extra lane w/o additional cost (as you mentioned). Better to Indianize foreign ideas. Forgot to mention one big advantage - the cycle track as a road extension has the added advantage of allowing emergency vehicles much easier access to a trouble spot. Naveen, IDS : Yes, trees should be doable. Current plan has NO space for trees, so even the "plant" line that I put in is an improvement. @N: Pedestrian crossings : The plan is to provide it at every 500m. I think at the Petrol pump/ Big bazar turn they plan to provide an underpass for vehicles, so pedestrian crossing will be over it. But I dont know how they will provide it at other places without interuppting traffic flow. Needs more thought. 3rd adv is what Naveen has suggested. 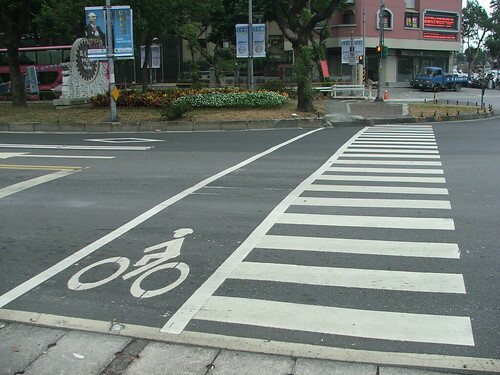 Immediate right turns / left turns, depending which side cycle track is on, becomes "pedestrian free" For crossing the road, you cannot avoid signals. Your third point - I am open to put the cycle track on the road side and we can use the verge, make it a tree line and if additional barrier is needed, that also can be done and may be better than the outer edge because of the areas like Audigodi/Madivala with high number of cluttered shops. One thread I have heard from multiple people (not so much on this forum) is that there is no need for cycle lanes, or we should be able to convert the cycle lane to road space ..
What I am saying is there is pure economic and practical reasons why people will get on to it - as against it being just a health/green fad. You are bang on. In fact that is the next big idea I want to suggest, better to have 4 consistent lanes and additional lanes for turning/parking etc rather than 6 lanes which get used for everything. Watch a blog with that heading in the next few days. I think currently lane width used is 3.65m - am suggesting 3.5m (including lane markings) I doubt they will be willing to go below that - somehow they were not comfortable with reduction further. IRC is pretty flexible, US uses 12 ft inside city ~ 3.65m, you can go down to 11 ft ~ 3.35m but need approval. 'Normalizing' traffic on Hosur road will surely set an example how highways traffic can be streamlined and probably in the long run give a stiff competetion to BETL on how fast one can reach EC! About trees..still remember the huge ficus trees which lined hosur road and were removed by L&T when the road was expanded..there were so many of them then..it was beautiful.. However as said we cannot go the Ficus or Tamarind way now..and not rain trees either..Hongemia should be a good option as they are strong and grow fast. The girth is not too big compared to the canopy..and damage to pavement is minimal..so it should be a good option! About cycle tracks..we need to remember that this road is NH7 and NHAI will also have a say on what changes are made..probably they will make it too..I do not see a cycle path plan on NAHI website..it will be interesting to see what their opinion on that..
My personal opinion is cycle rides are good if they are for journeys less than 30 min/6-8KM one way..unless one is an diehard cyclist..EC is close to 10KM from SB..I am not sure many would ride till there..may be a BRT would be a good option! 158 users have liked, including you. Absolutely right - If we create the necessary infrastructure, people will use bicycles. Presently, bicycles are the most poorly served of all modes & there's no other way to turn this around other than by creating space & facilities for them. Any idea about Langford rd signal, Bannerghatta rd signal, Adugodi signal, Koramangala signal, Sarjapur rd signal etc. en-route this stretch ? BBMP is on record saying that all Big-10 roads will be converted to "signal-free" corridors. I don't think putting up bicycle tracks for about 6.6km is with the idea of facilitating people to ride bicycles all the way from Vellara to EC, let alone to Silkboard Jn. There will be many (probably most) who will use them for shorter distances inbetween, & greatly appreciate the facility. I don't think the stretch we are discussing is under NHAI. If I'm not mistaken, NH-7 begins at Silkboard towards EC /Hosur. If turns along the stretch are removed by using magic boxes or equivalent & provision of slip lanes /exits, a wide median with turn lane may not be required, but I feel it may be sensible to 4-lane the stretch than 6-laning it & cramming for space for other users & utilities. We have not considered utilities such as electric cable ducts, water supply, etc - these may also need to be factored in. cycles is the way to go..
My bad, I was thinking this discussion was for the entire stretch to EC..
NH7 is still passing thru Vellara jn towards Hosur..google maps also marks it..but probably BBMP maintains the road inside the city as you mention..
Any idea if there is any plan to make the road organized all the way to EC? 2. Current utilisation is small. Start with this and we can revisit later if higher capacity is required. I think it is OK, especially point 2 is valid. I also think they have gone too far ahead to change things and my plan is a little sophisticated and am .not sure of their ability to implement well. Also the plan now is totally 4m on each side (got an additional m:) which is not bad, even otherwise. Footpath+cycletrack material wise: 1.3m of interlocking cement grid pavers, 1.4m of drainiange in between which will have slabs, aobve which will be mortar base, above which tiles (red), and again 1.3m of interlocking cement grid pavers. @ Naveen, end is utilised for cabling, hence draininage is not at end. Not much choice of materail, pavers because they want it to be easily removable for cable work etc. Other side of drainaige can be used for water pipes etc. He says interlocking pavers degrade because quality is not good, dont cure for sufficient time - will ensure good quality this time around. Division between footpath and cycle trac ~ 2m, will be soft, can be adjusted by marking later. Drainage access: Every 10m or so have metal cover. Somethings that as regarding quality : no obstruction on footpath (moving poles to edge), dipped kerbs (so will be smooth - wheelchair freindly) at least they say they will implement. Blind freindly, if you have specific inputs or give me contact, I will follow up, but my current thinking is wheelchair freindly to start initself will be a big step. For those seriously interested, see the documentation on footpath that I have put out. Plan to do ~ 150m opp Madhuban apartments in the next week or so for a sample. If you guys happen to look, can post your feedback here. @sanjavv, Citizen matters :know Vijay well and have sent him material as well as called him up, no technical inputs as such - if you know anybody who cycles and has inputs, please ask him to post here. Do you know if the road will retain some kind of geometry or will it be a snaking flowing road with chicken necks, uneven lane sizes, warts, bumps and all? Hosur Rd Widening - Magic boxes & trees ? 4) At '+' junction along Hosur rd at Adugodi. For these two intersections, if grade separation is not being considered, they would have to leave them as signalized intersections, & the road design (after widening) will have to take this to account. Can there be no space allocation for trees or green strip/s ? The road will suddenly turn barren after the many existing ones are removed. Great work on the pedestrian/cycle track. Here is an example of tactile tiles that can be put for the visually impaired at pedestrian crossings. Did you manage to have a chat around this signal free idea? a. Silkboard junction is going to be a mega mess - elevated road pouring its traffic. ORR pouring its traffic (the stretch between SB Jn and Hebbal will be signal free). How do they propose to manage the flow there. b. BTM road will be a nightmare. c. Hosur Road - both Laskar and Adugodi will see massive flow rates due to unhindered traffic. d. With the current plan they will move the problem to either the cemetery signal or to Johnson Market. e. Where have the pedestrian crossings been planned for this signal free stretch? Any pelican signals planned? There is a need for a north-south express way corridor which would have included dedicated PT on the same. But I didnt think they would take this shortcut. On the other hand a big dig for Bangalore probably wasnt worth it. Layered streets have helped reducing junctions in other cities. The closest I can relate to is Stockholm. Its not like we dont need to have any underpasses, atleast it is being built in a corridor and not in disconnected places. We are clearly underbuilt on roadspace even if you assume vehicles (private + public) will balance out at current levels for next 20 years. It would seem to me a real pity that major roads are still being remodelled with storm water "being taken somewhere else" instead of designing point of source infiltration systems. Imagine the waste of concrete, granite slabs or whatever they use to take storm water in open drains to some lake or the other! Is not Praja's role to disabuse BBMP of such beliefs? Reason appears that while digging, they stuck a 66kV cable line, which went ka-boom and needed to be fixed. So they went to BESCOM asking them to shift the cable. BESCOM is asking a huge (sorry, wont disclose, but its really huge) cost to shift the cable and thats where its stuck now. I know this is quite frustrating, but whats the way out ? I think it makes sense to have Roads entirely under one deparment. So this one deparment will put in all the infrastructure for the electricity, water lines etc in addition to the asphalting/footpath and will be paid by the respective utilities on some rates. This is what I was thinking for design/engineering aspect (one guy has ownership to design the entire road, including utilitiy lines, footpath etc), but looking at this problem, I am more convinced this is the way to go. Sorry to generalise here, but I think overall, we should not be doing what is usually done, ie have one more body (eg: BMLTA, or a body for NMT as was done in Pune recently) to solve the probelm. More organisations means harder co-ordination, hazy ownership, bigger mess. Consolidate with fewer organisations with clearcut and thoughtfully structured ownership, explicit chain of command. will be paid by the respective utilities on some rates. This is the key. All organizations need agree on a rate card persqft or per running ft. In such cases BBMP will make a plan to shift put it for approval and if not cleared within one week should be deemed to be cleared and go ahead and do it themselves. BESCOM can pay them the agreed rates or the money can be drawn from a permanent interdepartmental escrow guaranteed by the govt. If BESCOM wants to do it cheaper let them step in within the week and do it at their cost. This will also force the BBMP to make provisions for these utilities properly in the plan so they are not laid Ad-Hoc by all organizations all over the place. Public cannot wait for internal wrangling to be sorted out. New to Praja. These discussions on Hosur Road design are extremely interesting. I tried accessing your design doc at http://www.filesanywhere.com/fs/v.aspx?v=896e638a5f6171af9da6 but it says link has expired. Would you be able to resurrect it? Also, do you have an integrated doc that talks about both footpath and road design from your sister blog? I was interested in seeing how you've accomodated bus bays. The streamlining doc has an image on bus bay. No, there is no plan to integrate the docs. Any updates on when we can see the work starting ? Is this effort getting integrated with the signal free corridor proposal ? Still working on creating a duct to shift the BESCOM cable. There is a meeting planned towards end of this month (Dec) to review (just between me and CE). If any of you are interested in joining, drop a note. It will be arranged ad-hoc and focussed just on Hosur Road.